Quite possibly Spain’s most beautiful town, Salamanca’s buildings appear to glow. The local sandstone used to construct most of this 13th-century university town’s churches and historic mansions seems to turn gold when the sun beats down. Salamanca’s old town is in remarkably good condition and boasts the highest concentration of Plateresque architecture in the world. International prestige came to the town in 1254 when the Pope named Salamanca’s university as pre-eminent in the world, on a par with Paris, Bologna, and Oxford. The university was considered to have one of the best science faculties in the world and was quite avant-garde, having female professors as far back as the 15th century! The golden age of Spain (the 15th and 16th centuries, when Spain benefited outrageously from the spoils of its colonies in the new world) was also a golden age for Salamanca. Many beautiful palaces and religious building were erected during this period, including the lovely Palacio de Monterrey (considered to be one of the most beautiful Renaissance palaces in Spain, currently owned by the Dukes of Alba). The city has an impressive history, with many illustrious characters having passed through the city. One of its first notorious visitors was Hannibal, who attacked the then-called “Salmántica” when it was part of the Roman province of Lusitania. Christopher Columbus visited the University of Salamanca while planning his travels to the Indies. The writers Fray Luis de Leon, Miguel de Unamuno, and even Spain’s most famous writer, Miguel de Cervantes Saavedra, also spent periods of time in Salamanca, as, during the golden age, it was a city that fostered the arts, literature, and learning. The great Spanish monarchs Isabel and Ferdinand were in Salamanca for various important events in their lives including the death of their son Don Juan. At the battle of Arapiles, a terribly bitter battle, Lord Wellington’s troops defeated those of Napoleon’s- all at the gates of the city! Sitting in the 18th century main square (“plaza”) in Salamanca, you will see dozens of busts that testament to the city’s heroes and luminaries. There’s a bust of Wellington, a bust of Cervantes, even a scratched out bust of the dictator General Franco. Sipping on your glass of wine (from the nearby wine regions of Rueda, Toro or Ribera del Duero), and watching the storks swoop over the steeples of this magnificent square, you will fall in love with Salamanca. It is a noble, beautiful city, but thankfully not a living museum due to the high amount of university students who serve to make the town one of the liveliest in the country. You could spend a weekend in Salamanca, with the sensation that you have to come back and see more, maybe spend a few weeks, maybe a summer. Salamanca is a “must see” for art & history lovers and is also a good base for vineyard touring, as you have many quality wine regions nearby, not to mention some top-notch dining options. The city of Salamanca is located in the region of Castilla y Leon (the castle and the lion), northwest of Madrid. Meat and rich red wines are ubiquitous in the region. Specialties include Chuleton de Ternera (enormous beef chops), Cochinillo or tostón (suckling pig), Cabrito (roast kid), Cordero (roast baby lamb) “Chanfaina” (rice with lamb and sometimes tripe), and “Hornazo” (a savory pastry stuffed with meat and egg). To accompany these heavy meats, strong wines are in order. The full-bodied red wines, Tempranillo-based (called “Tinta del Pais locally) from Ribera del Duero, Toro and Las Arribes del Duero suit the cuisine perfectly. Table wines are made in the beautiful Sierra de Francia (“French mountains”, named after the region south of Salamanca where Napoleon’s troops were based during much of the fighting between the British and the French). For non-meat dishes, the delightful white wines from Rueda are super and amazing value for money. Salamanca’s arcaded Plaza Mayor is one of the most beautiful in Spain. Building began in 1729 by Alberto Churriguera and it took another 25 years to complete! The perfect place to soak up the atmosphere and enjoy a “Vermut” (dark vermouth) or a coffee. Founded in 1254 by King Alfonso the Wise, the building we see today was actually erected in 1435. The university was built under the order of Pope Luna (Benedicto XIII) and took about 20 years to build. It is one of the best examples of Plateresque architecture in Spain, with a stunning façade. 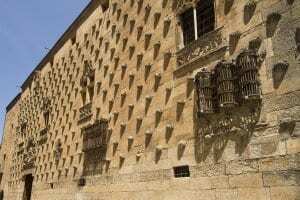 Probably Salamanca’s most emblematic monument, the House of Shells was built in the 15th century by Rodrigo Arias Maldonado, one of King Ferdinand and Queen Isabel’s ambassadors. He was a member of the order of Saint James, which explains his choice of the scallop to decorate the façade. If you look above the main door, you will see King Ferdinand’s coat of arms. Today, this beautiful palace houses the local library. Beautiful Plateresque palace, built in 1569 for an aristocratic family. You can see various coats of arms belonging to powerful clans such as the Fonsecas, Sotomayors and Ulloa Castros. Today, it is one of the many, many palaces owned by Spain’s notorious Dukes of Alba. This convent of Dominican nuns is absolutely gorgeous. Located in the pretty Concilio de Trento square, the convent was first built as a private palace in 1419 for an aristocrat, whose wife later donated it to the nuns. It boasts a variety of architectural influences such as a Moorish (Mudejar) front door and a Plateresque church (which was added in 1533). From the cloister inside, you have beautiful views of the top of the Cathedral. Salamanca’s most unusual museum, the Casa Lis is an art nouveau rarity in the heart of Castile. Built for an extremely wealthy local industrialist (Don Miguel Lis) at the beginning of the 20th century, it was transformed in the 80’s by the Manuel Ramos Andrade foundation to an Art Nouveau and Art Deco museum. There is a beautiful stained glass ceiling, and a mind-boggling collection of Faberge eggs, scary dolls, beautiful glassware, and strange postcards from the 19th century. Different, to say the least.